Ski masks. Shredding. Rippers. It sounds like something out of a "Friday the 13th" movie. In reality, all these could be found at the VANS Canada youth snowboard event. 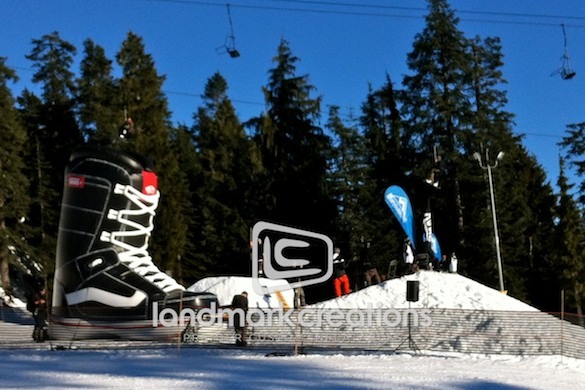 In addition, VANS had one especially popular star attraction: a custom, giant inflatable replica of their bestselling snowboard boot, the Hi-Standard. The event, named in honor of VANS' iconic product, brought in kids from all across the country to show off their enormous talent. But a chance to shred some of the best slopes in Canada wasn't all these young people got. At stake was a total of $12,000 in cash and prizes starting with $5 for every "stylish trick" they performed. VANS Canada has been around since 1966. While they are known mostly for their footwear and apparel, they have been producing snowboard boots for over 18 years; plenty of time to develop a loyal following. It's these kids, and those that are new to the brand, that flocked to the series. The events took place at four pristine locations: Mt. Seymour, BC, Horseshoe Resort, ON, Winsport Canada, AB and Ski Bromont, QC. Here you could find boys and girls of all ages including some little kids with a few pretty big moves. VANS' Marketing Manager, Bobby Gascon, told us about the impact this inflatable product replica has had at their series. "The press coverage is currently [the giant inflatable replica's] most measurable asset, but we strongly believe it will benefit the awareness of our product offering. We have so many people onsite that get their photos taken beside [the inflatable]. It's flattering as a brand."